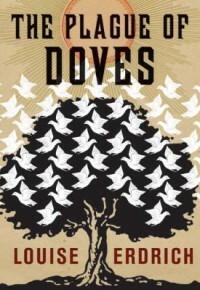 Erdrich's characters in The Plague of Doves will shadow me for a long time to come. Her poetic and heart wrenching descriptions of the grim realities of a small American town coexisting with a First Nation reservation is masterful. There are no borders of time in the storytelling, nor do emotional or psychological perimeters exist within the characters themselves. It is a journey of filtered perceptions; three different narrators must come to terms with a murder that occurred three generations ago. The pain and suffering experienced by each character follows a continuous ebb and flow of the historical and the emotional. The town is decaying, characters are growing old or moving on. Cordelia attempts to erase past wrongs by declaring a 'town holiday to commemorate the year she saved the life of her family's murderer.' But what about the murder of Holy Track, Asiginak and Cuthbert, falsely accused and hung without a trial? The memory of the injustices they suffered, have faded away, 'the air is so black I think already they are invisible.' Powerful novel!